Can Marcel Proust inspire one to murder? In Murder Chez Proust, Adeline Bertrand-Verdon, the unlikeable president of the Proust Association, is murdered just before a Proust convention. There is an assortment of suspects, including colleagues, lovers, and her assistant Gisele Dambert. Through a stroke of luck, Gisele owns a set of previously undiscovered notebooks used by Proust which proves the originality of a key scene in one of his most famous novels. It would have settled a debate in Proustian circles, and Adeline was going to steal Gisele’s research and publish a book. Gisele is probably the most intriguing character in the book – an aspiring Proust scholar who lives with her cat and has a penchant for carelessness. She makes some idiotic decisions, such as letting Adeline know about her research, but overall, you root for her to succeed. 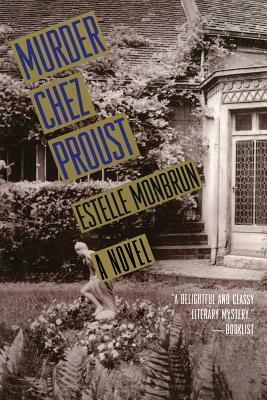 Murder Chez Proust is a solid, entertaining cozy, with an Agatha Christie-type list of suspects, and a genteel approach to murder. As someone unfamiliar with Proust’s work, I probably missed a lot of the significant little tidbits the author provided, but I did enjoy the description of how the interpretation of a single scene in one of his books can cause such heated scholarly debate. I wish the book had been more steeped in the academic world – the strongest scenes featured the politicking that goes on behind the publication of academic research, and I would have liked a bit more sense of that atmosphere. There was a subplot mystery that I admit drew most of my attention — Gisele loses the Proust notebooks and tries to track down a hotel employee who had held them last. In some ways, it stole the spotlight from the main murder mystery, but it may just be because Gisele is a more interesting character than Adeline who, though villainous and potentially intriguing, was never quite fleshed out enough to go beyond a stereotype. Thank you to Thomas Allen for a copy of this book in exchange for an honest review. This entry was posted in Book Reviews and tagged 50BookPledge2013, Fiction, Mystery, Thomas Allen & Son by Jaclyn. Bookmark the permalink.